Put your adventure pants on and get ready for the wildest Niagara experience, a visit to the one and only Cave of Winds. This natural cave is located directly behind Bridal Veil Falls, the closest point you can get to the falls themselves! The cave was discovered in 1834, donned at the time Aeolus’ Cave, Greek for the "God of Winds." The cave itself is 130 feet high, 100 feet wide, and 30 feet deep. The thrilling walk to get to the cave is almost worth the entire trip, a slippery trek into tropical storm-like conditions right behind the falls. Slip on your very own souvenir rain poncho and specially designed slip-resistant sandals and take a wild adventure into the stormy mist zone, the perfect place to "soak it all up," literally! 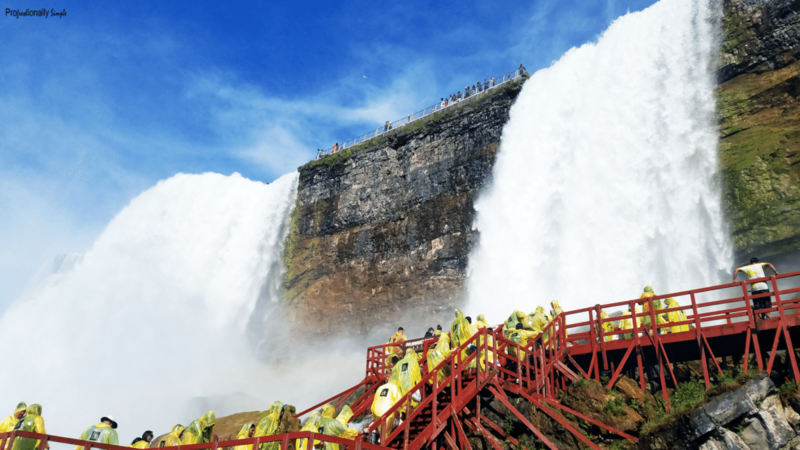 Your adventure will start with an elevator ride 125 feet down into the gorge, at the end of which you will grab your rain gear and then follow the wooden walkways to Hurricane Deck, mere feet from the torrents, close enough to touch the rushing Bridal Veil Falls. The tropical storm-like conditions will allow you and your group to appreciate the pure power and grandeur of the falls! If you happen to visit during the spring season you will get a special type of tour, one in which you can see the wooden decks themselves being built, the strong water and wind conditions forcing the crew to remove the wood every November and then build it up again in the spring!